Italy: Gabriele D'Annunzio leada a raid to annex Fiume and conceives of the plan later adopted by Mussolini to march on Rome and seize the government. Spain: Day 58 of 985 of the Spanish Civil War. Spain: Day 423 of 985 of the Spanish Civil War. CBI - China: Day 68 of 2,987 of the 2nd Sino-Japanese War. Day 31 of 106 of the 2nd Battle of Shanghai. Day 12 of 70 of the Battle of Taiyuan. Germany: Hitler demands the Sudetenland, saying the Sudeten problem is an internal matter for the German minority in Bohemia and the Czecho-Slovak government. Spain: Day 788 of 985 of the Spanish Civil War. CBI - China: Day 433 of 2,987 of the 2nd Sino-Japanese War. Day 94 of 139 of the Battle of Wuhan. Poland: Day 12 of 36 of Germany's Invasion of Poland. The battle of the Vistula Bend flares up near Kutno, the last major engagement of the Polish campaign. The Luftwaffe bombs Krzemieniec. CBI - China: Day 798 of 2,987 of the 2nd Sino-Japanese War. CBI - Mongolia: Day 125 of 129 of the Battle of Khalkhin Gol. ETO - UK: Day 7 of 258 of the Blitz. ETO - UK: Day 65 of 114 of the Battle of Britain. Germany: Claims are made that the RAF is dropping Colorado beetles over German potato crops. East Africa: Day 95 of 537 of Italy's East African campaign in the lands south of Egypt. CBI - China: Day 1,164 of 2,987 of the 2nd Sino-Japanese War. Day 303 of 381 of the Battle of South Guangxi. Day 24 of 42 of the Hundred Regiments Offensive. Russian Front - Finland: Day 83 of 164 of the Battle of Hanko. The Soviets will be forced off their leased naval base. Russian Front - Finland: Day 9 of 28 of Finland's reconquest of East Karelia in southern Finland. The Soviets continue withdrawing from Finland back to Leningrad. Russian Front - Finland: Day 76 of 142 of Operation SILVER FOX, a joint German-Finnish campaign to capture the Russian port of Murmansk in the Arctic. The German troops continue withdrawing back into northern Finland. Russian Front - Finland: Day 74 of 140 of Operation ARCTIC FOX, a joint German-Finnish campaign against Soviet Northern Front defenses at Salla, Finland. Russian Front: Day 83 of 167 of Germany's Operation BARBAROSSA, the overall invasion of the USSR. The first snow appears on the Russian Front. Russian Front - North: Day 5 of 872 of the Siege of Leningrad. Russian Front - Center: Day 14 of 14 of the Battle of Roslavl-Novozybkov, Russia. The Germans have captured these two cities. Russian Front - South: Day 36 of 70 of the Siege of Odessa, Ukraine. Russian Front - South: Day 21 of 35 of the 1st Battle of Kiev, Ukraine. German troops at the Kremenchug bridgehead cross the Dnieper in the Ukraine and advance north to aid in the encirclement of Kiev. MTO - Libya: Day 156 of 256 of the Siege of Tobruk. Middle East: Day 19 of 24 of the Anglo-Soviet invasion of Iran. East Africa: Day 460 of 537 of Italy's East African campaign in the lands south of Egypt. CBI - China: Day 1,529 of 2,987 of the 2nd Sino-Japanese War. Day 7 of 33 of the 2nd Battle of Changsha. Russian Front - North: Day 370 of 872 of the Siege of Leningrad. Russian Front - North: Day 131 of 658 of the Siege of the Kholm Pocket, USSR lays siege to the Kholm Pocket but the Germans hold out for a about a year and a half. Russian Front - Center: Day 45 of 64 of the 1st Battle of Rzhev-Sychevka, Russia. Though it will end in a stalemate, it will keep German troops from going to Stalingrad. Russian Front - South: Day 77 of 150 of Germany's CASE BLUE, the failed offensive to take the Caucasus oil fields. Russian Front - South: Day 21 of 165 of the Battle of Stalingrad, the bloodiest battle in human history. MTO - Libya: US B-24s attack Tobruk and Benghazi. MTO - Egypt: US P-40s fly three scramble missions along the frontlines. East Africa: Day 131 of 186 of the Battle of Madagascar. CBI - China: Day 1,894 of 2,987 of the 2nd Sino-Japanese War. Day 121 of 124 of Japan's Zhejiang-Jiangxi Campaign, launched to punish anyone suspected of aiding the Doolittle raiders in China. Roughly 250,000 Chinese will be killed. PTO - Alaska: Day 98 of 435 of the Battle of Kiska, Aleutian Islands. The US and Canada will defeat the Japanese invaders. PTO - Malaya: Day 206 of 357 of the Battle of Timor Island, a long guerrilla war ending in Japanese victory. PTO - New Guinea: Day 54 of 119 of the Battle of the Kokoda Track. The Australians begin pushing back the Japanese troops. This will become an Allied victory. PTO - Solomon Islands: Day 37 of 187 of the Battle of Guadalcanal. PTO - Solomon Islands: Day 1 of 3 of the Battle of Bloody Ridge on Guadalcanal. 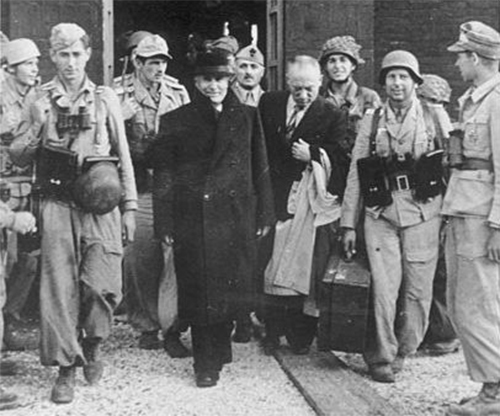 MTO: In a daring high-risk raid, Germans rescue deposed fascist dictator Benito Mussolini, held prisoner at a hotel in northern Italy, and set him up as head of a puppet state in German-occupied Italy. On 25 Jul 43, a few weeks after the allied invasion of Sicily and bombing of Rome, the Italian Grand Council of Fascism voted to depose Mussolini and replaced him with Marshal Pietro Badoglio. Mussolini was subsequently arrested on orders of King Victor Emmanuel. After his arrest, Mussolini was transported around Italy by his captors. SS officer Otto Skorzeny was selected personally by Hitler to carry out the high-risk rescue mission. The commando team crashed nine gliders into the nearby mountains, then overwhelmed Mussolini's guards without a single shot being fired. The operation granted a rare late-war public relations opportunity to Hermann Goering. Mussolini was made leader of the Italian Social Republic (a German puppet state consisting of the German-occupied portion of Italy). Nazi propaganda hailed the operation for months, the Axis otherwise having little about which to boast in the fall of 1943. As it turned out, it was the last of Hitler's spectacular gambles to bear fruit. For Mussolini, however, the end would come in late April 1945. With total defeat looming, he attempted to escape north, only to be quickly captured and summarily executed near Lake Como by Italian partisans. Russian Front - North: Day 735 of 872 of the Siege of Leningrad. Russian Front - North: Day 496 of 658 of the Siege of the Kholm Pocket, USSR lays siege to the Kholm Pocket but the Germans hold out for a about a year and a half. Russian Front - Center: Day 37 of 57 of the 2nd Battle of Smolensk, Russia. Becomes a Soviet victory as the Axis are pushed completely away from the Moscow region. Russian Front - Center: Day 27 of 48 of the Battle of Bryansk, Russia. German troops continue retreating. MTO - Italy: British 8th Army forces capture Crotone on the Italian toe. The US 9th and 12th Air Forces provide the air cover. MTO: US 9th Air Force B-24s hit the Kalathos and Maritsa airfields on Rhodes. CBI - China: Day 2,259 of 2,987 of the 2nd Sino-Japanese War. PTO - New Guinea: Day 144 of 148 of the 2nd Battle of Lae-Salamaua. Will become an Allied victory. PTO - Solomon Islands: Day 29 of 56 of the Battle of Vella Lavella. The Allies will win this one. ETO - France: Day 43 of 284 of the Battle of Brittany. ETO - France: Day 29 of 32 of Operation DRAGOON, the Allied invasion of southern France. ETO - Belgium: Day 11 of 62 of the liberation of Belgium. The German garrison at Le Havre, France, surrenders after very heavy fighting. ETO: US 8th Air Force: B-24s and B-17s bomb various targets in Germany. Russian Front - South: A German-Hungarian counter-offensive grinds toward Arad and Temesvar in Hungary. MTO - France: US 12th Air Force fighters hit targets in the Belfort, Basel, and Freiburg areas. MTO - Germany: US 15th Air Force: Heavy bombers attack the Lechfeld Airfield, Munich/Allach engine works, and Wasserburg jet aircraft factory. MTO - Italy: US 12th Air Force B-26s blast defended positions along the Gothic Line. B-25s pound targets at the Po River. Fighters attack positions in the Genoa and Milan areas. MTO - Greece: German troops evacuate Rhodes and other Greek islands in the eastern Mediterranean. CBI - Burma: Day 165 of 302 of the Chinese Salween Offensive in Burma. CBI - China: Day 2,625 of 2,987 of the 2nd Sino-Japanese War. Day 149 of 259 of Japan's Operation ICHI-GO. PTO - New Guinea: Day 273 of 597 of the Battle of New Britain. PTO - New Guinea: Day 144 of 481 of the Battle of Western New Guinea. PTO: UK's Mountbatten accepts the surrender of all Japanese troops in Southeast Asia. USA: After forty years as an escaped POW, German Georg Gaertner finally turns himself in to authorities. He had escaped from Camp Deming, New Mexico on 21 Sep 45 to avoid being sent back to his home town in Germany which was in the Soviet occupation zone. He spent the last 40 years living quietly in California, getting married, raising a family and having grandchildren, but finally wanted to set things right. Gaertner/Whiles' "surrender" was actually to Bryant Gumbel on the Today Show. 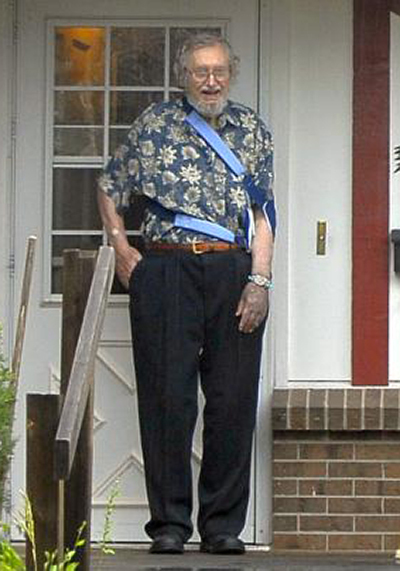 He effectively became the last World War II German prisoner of war in America. Gartner was not an illegal immigrant, since he had been brought to the United States against his will. He had escaped from prison because he was due to be sent back to his hometown in Silesia, one of the German provinces that became part of Poland due to border changes promulgated under terms of the Potsdam Agreement, and from which nearly all Germans thereafter were expelled by the Soviets. Because of this, he was not charged with any offenses. But until late 2009, he was not a United States citizen; he had only a residence permit. In November 2009 he was finally naturalized as a citizen of the US. In 1985, he published a book about his experiences called Hitler's Last Soldier in America. Georg Gaertner passed away on January 30, 2013, in Boulder, Colorado.